The last week of every September is Deaf Dog Awareness Week, a time for celebrating the aurally challenged pooch and highlighting its condition. Tens of thousands of dogs are born or become deaf every year in the UK, with a high percentage of these ending up in shelters because of their "disability." Many people often write deaf dogs off as too difficult to live with and train, but they couldn’t be more wrong. In fact, those with non-hearing dogs very often say they’ll never have a hearing dog again! Sometimes, like humans, dogs are just born deaf. This is called congenital deafness and may be the result of illness or malnourishment during pregnancy, or difficulties in labour. Other times, deafness is simply a birth defect like any other naturally occurring birth defect. Accounting for sudden onset deafness are factors such as illness, trauma (including noise), infection, drug toxicity and old age, with most dogs experiencing a degree of hearing impairment as they get older. Unfortunately, coat colour and pigmentation are also strong indicators as to whether a dog can hear or not. Deafness is often connected with white dogs, especially those with blue eyes. Pigment-producing cells, known as ‘melanocytes,’ are absent in these dogs and, because the specialised cells in the inner ear originate from the same stem cells as pigment-producing cells, often the cells responsible for hearing are missing too. Dogs that are completely lacking in pigment are likely to have some degree of hearing deficit, if they haven't lost it altogether. For this reason, dogs with piebald, merle or spotted coats are more likely to be deaf than dogs with parti or solid coloured coats. Susceptible breeds include Dalmatians, Bulldogs, Boxers, Australian Cattle Dogs and Kelpies, English Setters, Catahoula Leopard Dogs, and Bull Terriers, although 85 breeds have reported congenital deafness. Dogs with hearing deficits may be deaf in just one ear (unilateral) or in both ears (bilateral). Their condition may be immediately obvious, or you may initially put their disobedience down to a behavioural problem. Although you can conduct a range of tests yourself i.e. whistling, clapping your hands, calling your dog, the only definitive way of knowing if your dog is deaf or not is to have your vet perform the BAER test (Brainstem Auditory Evoked Response), which measures the brain's response to sound stimulation. If your dog's hearing is not within the normal range, it may be partially or completely deaf. What are the signs/symptoms of deafness? Sometimes, your dog's hearing is impaired temporarily i.e. due to an ear infection, build up of wax or an obstruction of hair in the ear canal, and a simple course of antibiotics or medicated ear drops will clear the problem within a couple of days. Other times, your dog's hearing will show no signs of improvement, which could be a sign of a more serious condition. Is it harder living with a deaf dog than a hearing one? Many people are initially reluctant to take on a dog with a disability. Of course they are, that's why so many end up being refused in a litter, abandoned or placed in shelters! There is definately a stigma attached to deaf dogs, with people tending to believe they are much harder to live with and train than hearing dogs. While they may be different to train, they do not pose that much more of a challenge in reality. Dogs cope surprisingly well with just four senses and, actually, become very adept at relying on their other senses to understand, interact and learn. The sight and smell senses in deaf dogs are usually far more heightened in dogs with a hearing impairment than in dogs with full use of their ears. The only real challenge comes in keeping them safe, as deaf dogs obviously cannot hear danger (i.e. traffic) and therefore are much more at risk. It is important to always keep hearing impaired dogs on a lead when out and about as they are not so easily summoned back if they stray too far. It goes without saying then that if your deaf dog is allowed outside (and off lead! ), this happens in a securely fenced garden with appropriate supervision. A deaf dog should never be left unattended unless you are certain he is out of harm's way and you have signalled to him that you are leaving. Dogs that are hard of hearing can become very distressed if they turn around to find you missing without being warned; a gentle tap on the shoulder or switching the light switch on and off before you disappear should sort out the problem. As long as the cue is the same every time, your dog shouldn't panic as it knows you will be returning. Another important consideration is how you wake your dog up every morning. Because deaf dogs cannot hear, they startle much more easily and touching them when they are fast asleep may lead them to act aggressively. Placing a bowl of food in front of them should be all that's needed to rouse them from sleep but, if you must touch them, do so gently and in the same place every time. There are many things to remember when bringing home a hearing impaired pooch; the first being that your dog does not know it is deaf, and will perceive any sympathy/sadness you show it as a sign it has done something wrong. The most important thing to remember in caring for a deaf dog is that it will only have a problem with its condition if you do. 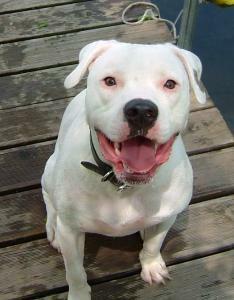 In fact, when given the love, care and training it needs, there should be no limitations to what your deaf dog can do. Deaf dogs are very easy to train using hand signals and can learn a fair few during their lifetime. The important ones to start with include sit, down, wait, come, "happy hands" and your dog's name. Because a deaf dog cannot hear your tone of voice, it is important to come up with a signal for praise and disapproval. Accompany these with happy/sad facial expressions and your dog will learn to understand when it has done something right and when it is 'in the dog house' for its behaviour. Also, don't forget to talk. He might not be able to hear you, but your deaf dog will be able to read your lips and make another association between your mouth movements and the instruction being given. Lastly, as you would for a hearing dog, always remember to reward good behaviours so that your pooch is encouraged to repeat them. Don't take anything for granted in your dog's training - this is easy to do with hearing dogs as they tend to pick things up more easily without you making a conscious effort to teach them. While deaf dogs need teaching most things, they are very adept at reading your face, mood and emotions. Because of this, many dog owners claim their deaf animals are far more in tune with them than their hearing animals. They are more dependent on you, their caregivers, and rely heavily on your kinesthetic guidance. Because they cannot hear (great news during firework season! ), their other senses are heightened, and most deaf dogs will be able to tell if you are feeling relaxed, happy, or having a bad day, more so than hearing dogs will. Their heightened eyesight also makes them wonderful watch dogs, who will bark when they notice someone approaching the house. For all the reasons listed, deaf dogs really do make the best companions. The bond is often so strong between deaf dog and owner that many would never have a hearing dog again. If you were considering adopting a dog with a hearing impairment, hopefully this article has convinced you to do so, as they really are no different from their sound of hearing counterparts.